We Are Reputed Manufacture Of Wrap Around Sticker Labeling Machine For Round container -NKSAL 120. This Wrap Around Sticker Labeling Machine Can Perform Wide Range Of Wrapping Like Wrap Around , Partial Wrap On Round Container Surface. 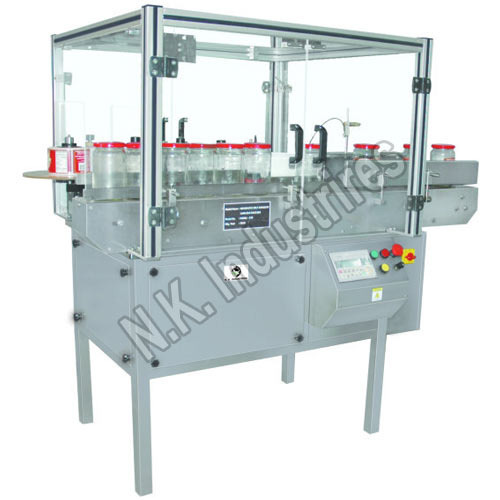 Speed up to 120 Bottle per minute depends upon the type of diameter of Round container. Accurate label dispensing due to use of either servo motor or efficent stepper motor inconjuction with mirco stepping driver. Facility to incorporate the Batch coding printing like Inkjet printing or hot foil coding or contact coding. No change part required for label and bottle. Following features are avilable on customer demand in our all range of wrap Around sticker Labeling machine. Automatic rejection system with separate conveyor.